I kept sticking with Under the Dome , largely because I have faith in Stephen King to tell a good story. It annoyed me for a long time, but the mysterious inexplicable happenings week after week finally started to pull me in. Now I’m hooked. Since the show has been renewed for a second season, I can look forward to learning some of the answers to the inexplicable. I’m getting attached to the characters, particularly Rachelle Lefevre as Julia and Mike Vogel as Barbie. These two are on a collision course and Julia doesn’t know it yet, but the viewers do. 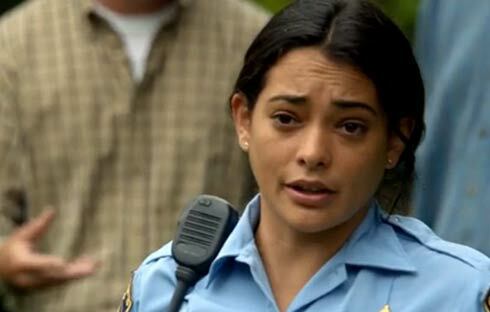 Natalie Martinez as Sheriff Linda Esquivel is fantastic. I love the idea that a Latina actress has a significant part in this drama in a role that traditionally would have gone to a white good-old-boy type. In terms of the inexplicable, the characters are as in the dark as the viewers. Everyone is struggling to make sense of the dome, and the egg. We thought two teens might have something to do with the dome, this week that circle enlarged to three and possibly a fourth. The teens, played by Mackenzie Lintz with Britt Robertson and Colin Ford as brother and sister, are the three we know about so far. I’m glad I stuck with Under the Dome long enough to get hooked. What has your reaction to this series been so far?